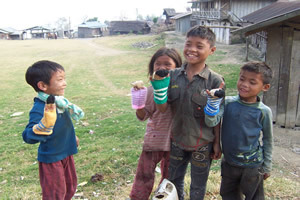 Nagaland is actually a state of India, in the far north-east, near the Burma border. Even though Nagaland is part of India, the Naga people are of Chinese origin. Fifty years ago, they were headhunters. Now, 90% of Nagas claime to be Christian. 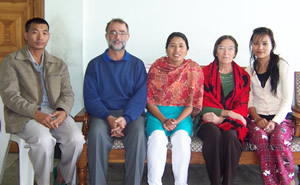 This is Throngji, wife Ayangla, and their three children. 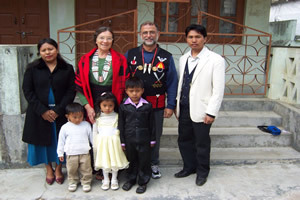 He operates Bethel Children's Home in Tuensang, and co-ordinates our ministry in Nagaland. Throngji was recently diagnosed with a cancerous tumour inside his skull. We were able to send him for an operation and subsequent radiation therapy. Pray for complete healing for him. 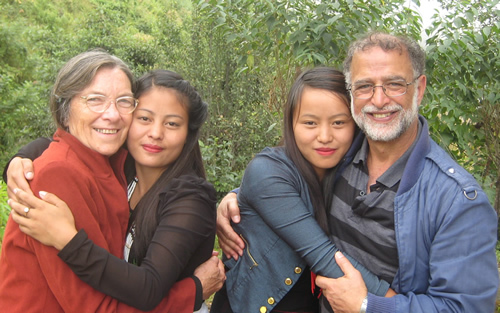 In 2014, we helped Throngji build Bethel Children's Home. 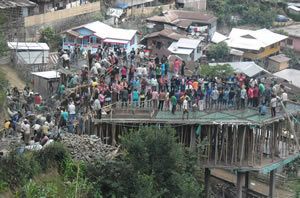 The photo shows Throngji's friends lined up, passing bowls of concrete to construct the building. BCH is now operating with 14 children. The ministry provides a loving home environment for orphans and children from poor families, a godly spiritual upbringing, and the opportunity for a good education. 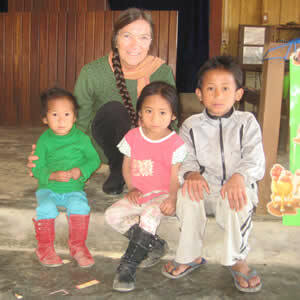 We have been several times, and thoroughly enjoy spending time with the children. It is great to see them happy, and to hear them singing praises to God (voluntarily and spontaneously)! This is Tsurila, one of the children. The kids at BCH singing '10000 Reasons - Bless the Lord, O My Soul'. The choreography may not be perfect, but the heart is right! 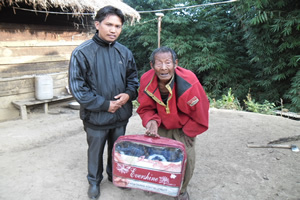 From time to time, we help Throngji buy food, clothes, blankets and medical supplies for the poor in the villages. Enjoy Throngji singing "The Old Rugged Cross". He sang this around the fire in the kitchen at KTC one evening. 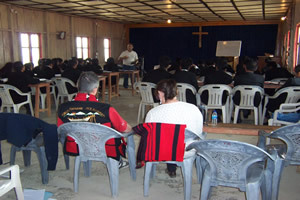 Ministry at Kihoto Theological College, near Yakor Village. Enrolments have gone from 19 to 102 students in the past five years! Praise God! KTC is in a very remote place, on the side of a hill. Originally, it was based in a small town. The Board decided to relocate to a remote place "so the students wouldn't be distracted by worldly things". The students at KTC, under the guidance of their principal and choir master Ato, practise singing in their 'spare time'. Enjoy as the KTC Choir transport you into the presence of the Lord singing the benediction "The Lord Bless You and Keep You"
Two of the wonderful students at KTC. They all call us 'mum' and 'dad'. In the past few years, these two students have hugged us tightly and wept solemn tears at our farewells. We didn't understand why ... we assumed it was merely gratitude for the help and support we have given them. 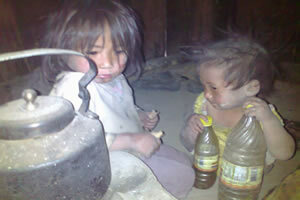 Recently, we found out that these - and many other young people in Nagaland - are orphans. Being able to call us 'mum' and 'dad' meant a lot to them. At our farewell gathering this year, I was moved to exhort the students to love and care for each other. It was a very emotional time for all of us. In 2017, we were able to install 400 metres of electrical cabling, a pump, and lots of pipe to renew the water supply at KTC. It was a huge job! We praise God for giving wisdom and skills to those who are willing 'to do the work'. 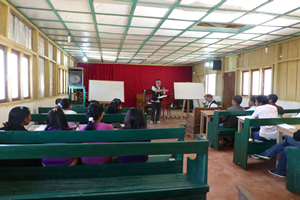 Imlong Theological College, in Tuensang. Mr Imlong has sacrificed a lot to run this Bible College - donating his land and facilities and using his wages to pay the lecturers' salaries. 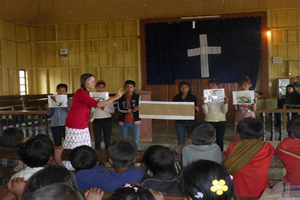 Beth teaching children in one of the villages in Nagaland. Eight hundred children in one Sunday School class! 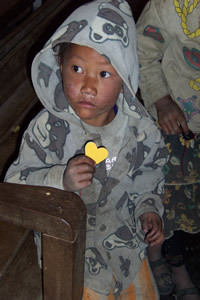 A simple heart - cut out by a helper in Western Australia - means a lot to a little boy in Nagaland. 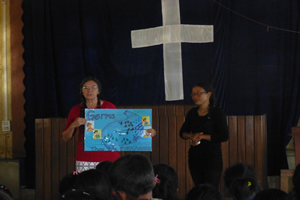 Beth teaching the mothers about basic hygiene. Some hand-puppets made by our friends in Western Australia. 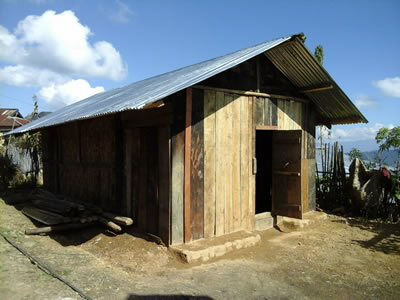 The villages in Nagaland are very poor. These two girls - the 'kettle kids' - and many others like them, sit alone in their huts all day long, as their parents work in the fields. 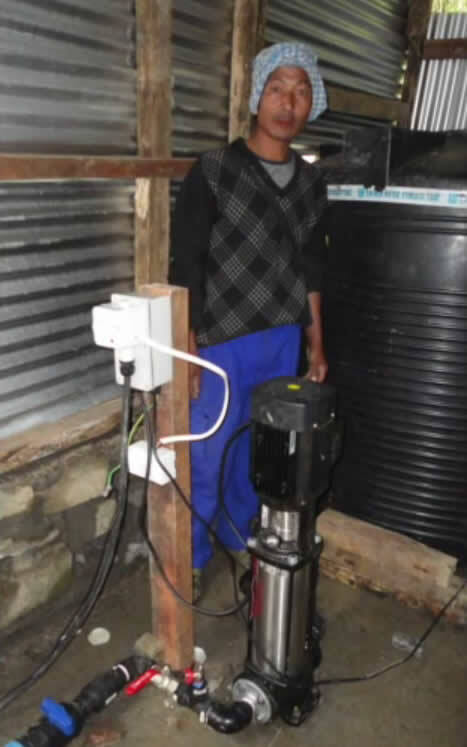 This family's entire possessions were a kettle, two plastic bottles, a pair of muddy shoes, and the clothes they wore. There were no beds, blankets or food in the hut. Through Throngji and our friends in Australia, we have been able to buy food and clothes for them. This is Yimji. He was born with a clubbed foot. In 2017, we were able to take him to hospital for an operation to turn his foot around. He was so happy! 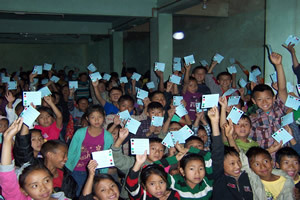 In 2012, the Lord enabled us to print 5000 Bibles in the Yimchunger language, to be distributed free-of-charge in the villages. Prior to this, there were only 4000 Bibles available for 100,000 people in the Yimchunger tribe. Enjoy the young ladies in Nagaland sing. The words talk about their ancestors being headhunters. They want to sing, but they can't because they killed each other. But now the new generation is here. The new shoots are growing - but we are educated, and won't make the same mistakes as our forefathers. Outwardly, Nagaland claims to be Christian. But many think they are saved by 'going to church' or 'doing good works'; and many are still influenced by animism and demonic spirits. Pray for a true knowledge of the gospel and the Bible, and to break free from any error. Pray for the students at KTC and ITC, that they may be adequately prepared for ministry. Give thanks! The Lord has been faithful! We have been able to sponsor some students since 2013, and build four new classrooms and a girls' dorm. Chukangla - Received treatment for paralysis to legs (2013). Lato - Received treatment for severe infection in his legs, which would certainly have killed him (2013). Zungkum - Had surgery to remove a tumour from his nostril, to help him breathe (2014). Retsula - Had surgery to fix a cleft lip (2014). We took 9 year old Kiumong to hospital to remove fluid and swelling from his skull, but the doctors said nothing could be done. Pray for him. 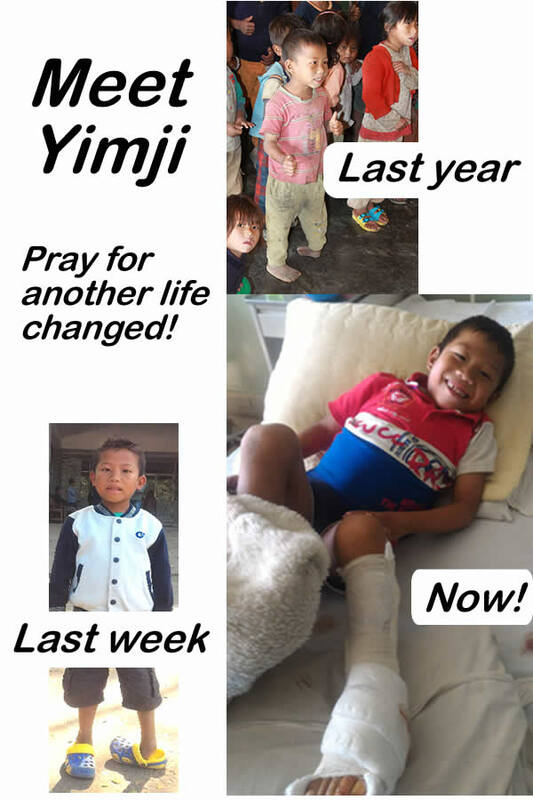 Yimji was able to have his clubbed foot turned around, so that he can walk properly (2017). Poverty relief Regular donations to buy food, blankets and medical supplies for various poor Christian families in the villages. Literacy Producing and printing various materials and resources. 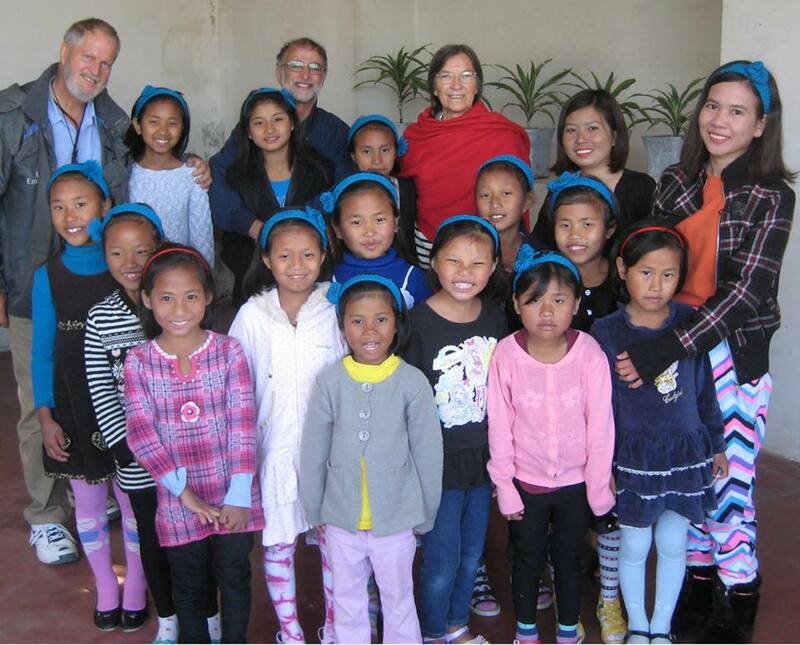 Bethel Children's Home A new life for 14 orphans and children from poor families.